It's a long way from Reigate! 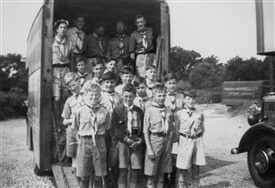 In the 1940s – 1960s most churches, some schools and purpose built huts had a scout movement attached. This not only applied to boys as Cubs and Scouts but many had girls as Brownies, Guides and Sea Rangers. I started as a Cub, meeting at Bishop Andrews Church in 1945 until 1948 when we moved and I joined the 5th Morden group at the Methodist Church in Green Lane where I remained until 1961. There was always an annual group photograph taken. I spent many happy years with the 5th Morden which I think was set up about 1936. We used to camp all over UK and even to the continent where one year we went to the Folies-Bergere in Scout uniform. For my first major camp we travelled to Lynton, Devon in the back of a furniture removal van with all our tents and equipment, Martells of Sutton comes to mind? I doubt this would be allowed today. Our nearest camp site was at Reigate Fort, the old ammunitions store built when there was a fear of being invaded by the French in 1898. We had great fun pioneering across the “moat’’ and even sleeping in the ‘’dungeons’’ if we arrived without tents and could not get into the warden's hut. The ‘’dungeons ‘’ were extremely cold especially in the winter when snow was on the ground. We often used our trek cart to take all our equipment to Reigate Fort walking all the way there and back. Again I cannot imagine doing that in today’s traffic. You will notice the Girl Guide in the picture. She was from the group based at the Congregational Church in Green Lane. They came up by bus for the day and accompanied us on our hike back to St Helier. Sometimes, if we took Cubs to camp, the Girl Guides invariably camped as well to take care of the Cubs. Several friendships were made between the Scouts and Guides resulting in many marriages. Some still going strong after fifty years. I should know - I have been married to a Sea Ranger since 1961. The trek cart could be disassembled into its component parts and used for competitions to be dismantled carried in pieces over an obstacle course and reassembled, the team taking least time being the winner. This was based on the navy competitions with their field guns which took place at the Royal Tournament. We made good use of the trek cart not only for camping. taking it with us on summer camps in the removal vans, but also for delivering fire wood, which we cut up from old railway sleepers, to elderly people in the area. We also collected jam jars and waste paper. the recycling of which raised much needed funds. Further funds were raised at Scout Weekends held once a year consisting of a show on Friday and Saturday night including a pantomime and several turns based on the well known Gang Show held at Golders Green. Saturday afternoon a sale of goods was held and on Sunday a church parade. This page was added by Ron Bird on 29/05/2011. Hi Carole thank you for the follow up, David is next to me on the shaft of the Trek cart. We did our first class hike together that was 21 miles over two days. We started in Westerham camping over night at the famous Reigate Fort. I remember he held his sheath knife close to an electric fence, saying we should see a spark between the knife and fence he got closer until it touched he got a shock, we wrote in our log '' it was not powerful enough to kill'' Tom was my second and was with me on my first ever camp in 1948. I was in the 8th.Morden Cub pack, never made it to the scouts, joined the Boys Brigade instead. I was in 2nd Morden Cubs at Methodist Church the joined 2nd Morden Scouts (a combination of 2nd, 5th and 10th Morden) we were based at Malmesbury School. Red & Yellow Scarf. I made it all the way to Patrol Leader with Badger Patrol! Just discovered this website and particularly the scouting section. 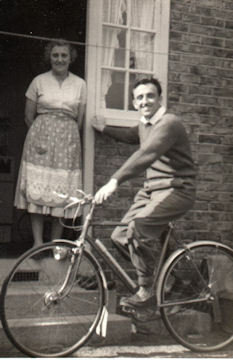 My parents Les and Olive Gooch for many years ran the 8th Morden Cub Pack at Glastonbury School. During holidays, the "Hut" in Glastonbury Road was the venue for meetings. The Hut was also the venue for the whist drives that were regularly organised, by my grandmother Ada, during the fifties and sixties along with jumble sales to raise money for groups funds. I was a cub in the 8th until I left to join a group nearer our home (3rd Banstead) but dad and mum kept on for many years even when the group amalgamated with the 14th. I did keep in contact obviously and even joined them as a helper for cub football and a number of camps. Interestingly, I eventually ended up at Glastonbury School where many of my parents' cubs went. I will try to look out some old photos - a few are posted on the Friends Re-United website. My mother is now 85 and suffers from serious memory loss and lives in Petersfield just off the A3. Les died nearly 20 years ago as did a number of other 8th /14th Morden scout leaders - Derek Warboys, Eric Piercy, and Ernie Batterbury. David Gentleman died about two years ago in Reigate. Who remembers: Patches campsite near Chessington, visits to the Zoo there, Summer camps in Kent and Angmering, Scout District Sports in Mitcham, football for cubs in Morden Park and film shows at the Christmas parties (quite a treat, during the 50w and 60s, especially the year Pepsi Cola sponsored things). 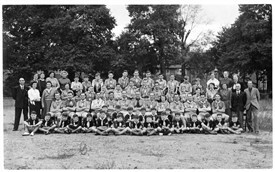 So many memories have flooded back, I may even have seen a photo of my parents who met through scouting standing in the background of a group shot. Alas my mother probably cannot help now but I will try. Having known the St. Helier Estate during my early life - my baby years being spent with Nanny Gooch at 4 Glasonbury Road. Also, having been a cub there, and then spending 6 years at the Glastonbury School for Boys, there is much to be gleaned from this site - a wonderful project - thanks for the memories. 2nd Morden Scouts was fed by two cubs troops - one at Methodist Church, the other at Garth Primary. Shame to hear Derek Warboys died - he was friends at school with my Uncle (Don Pearson) and scouted all his life. Was the District Commissioner when I was there. Did our survival camp at Patches snowed all weekend. Remember winning the Morden Scouts wide game even though only 3 of us could make it that day - think we made it into the local rag!! Lovely memories! I was a second in the Seagull Patrol. Our pack was the 3rd Morden based at The Holy Family School. I remember Mum managed to buy me a hat secondhand for a couple of bob, and she gave me 10 shillings to buy a shirt. There was only one shop that sold them and that was in Wimbledon....unfortunately they were sold out so the chap sold me a khaki one. Mum was annoyed because money was tight and she couldn't afford another shirt so she dyed the shirt green. I stood out like a sore thumb as it was a much darker green than the rest I was very embarrassed by it, however no one ever mentioned it for which I was grateful. Some happy memories of the 3rd Morden Pack. Hi Ron are you Ron Bird from Shrewsbury road or Garendon road? Do you have any bigger copies of those pictures? I would love to try and Identify a few faces, I can see my brother Stan on by the Lorry and I am sure I can see Len Scales and Eric Pearcy in the shadows. Glad to see 3rd Morden gets a mention. I was a Scout from around 1970 til 1972. I remember 'Skipper who had an old Burgundy transit minibus and then he traded it in for a more up to date light blue Transit minibus. First summer camp was in Belgium which I think was in 1970 & the year after was down in Cornwall. Weekends away were in Guildford I think where there would be lots of other scout groups. So many happy memories come flooding back reading this page. I joined the 2nd Morden (St Peter's) cub pack soon after moving to the estate in 1952 and then stayed all the way through to Scouts, Senior, Rovers, eventually running the Cub Pack (helped by Keith Harris, Sue Bellis and Margaret Robinson) while our mate Ron Kercher ran the scouts. Our scoutmaster Les Cartwright was a huge influence. He was a fireman (driver) based at Mitcham Fire Station. His daughter Mary also helped run the cubs. We had many great camping hoildays in places like Patches, Reigate Fort, Walton Firs and Ranmoor Common and one year we even all went to Germany in an old Dormobile. Scouting played a big role in our formative years and I still proudly put 'Queen's Scout' on my CV! I was a cub then a scout then senior scout at the 12th Morden group which had it's HQ at Bow Lane off of Lower Morden Lane.My UIncle was insstrumental in helping to build the hut. The 15th Morden used to share half of it. This would be between about 1957 or 8 until 1964. Timber Woods, who lived in Rougemont Avenue was Group Scout Master and all his family were involved. 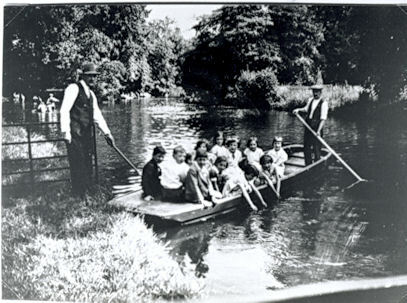 As were the Pocock family from Lower Morden Lane. How these stories bring back memories! I too remember Walton Firs and Patches. How about 'Operation Touchdown', a County camp at Walton Firs when we were supposed to have been visited by the then Chief Scout. Only it rained so much that he came by car! There was a time when involvement in the Movement meant a great deal to prospective employers. Is that still the case? I was a First Class scout with the Scout Cord. How pompous that sounds these days. But I did go on to becoming a Leader in a Troop in Kent as an adult. Scouting was a great pastime. I too recall wide games, first aid competitions and sports days in Morden Park and the name Derek Worboys certainly rings a bell. Keep up the good work with this site. The more good memories we can all share, the better! Well done for producing such a good website. The notes about the scouts are very interesting. I was a member of the 12th Morden Group, located in Bow Lane, Lower Morden. Not quite St. Helier but the group was in the same district as others from the St. Helier area and we all knew each other back then in the '60's. I have reproduced below an article which I wrote some time ago for the website of the 1st Lower Morden Group, which is the modern day offspring of my old group. Although the article is not specifically about St. Helier Scouts, some of you might be interested to read the reminiscences and I expect that many of you will recognise people, places and memories that I write about. Patches was an area of woodland and fern on the east side of the A243 road going towards Leatherhead. It is south of Chessington World of Adventure and a pub called the Star. Although it is not specifically marked on the map I think it is part of Ashtead Common. Indeed, we sometimes took the train to Ashtead Station then hiked west to get to it. I seem to remember that the way in by road was nothing more than a driveway type gap in the woods on the left as you drove towards Ashtead. It was a well used site with an ariel runway and a woodland chapel but nothing else apart from water taps. Quite who it belonged to or what Scout area ran it I do not know. Someone out there must know! It would have been 1960 to 1964 that I camped there. I am surprised that no-one else has come on here with Patches memories. Let me know what you find if you go there please. Hey Carol(Smith) I lost touch with you -we emailed I think on Friends Reunited. I remember you and Shirley Bannister ( lost touch with her - she was in Southampton last I heard) I used to go to the Guides in Green Wrythe School - there were twins who were the Captain and Lieutenant. Have some pics somewhere will have to find them.....hope you are well. John, went for a walk over Ashtead Common today. We found the track to patches off the main road. There is only one track in that area and it has a barrier across it. There is nothing there any more but I could identify several small clearings in the woods where there are no large trees, in the area where I recall we used to camp. The Corporation of London bylaws on the signs say 'No Camping' maybe that killed off its use as a camp site. Dear Peter, Thanks. If that's the case then it is a real shame. I have no doubt that there will be good reasons for the Scouts no longer using Patches but you and I would probably think that the benefits outweighed those reasons. I would be very interested to know exactly why the use was stopped. I wonder how we find out? I recall such good times spent there. I cannot believe that present day scouts have not got a place that is just as good. I certainly hope so. Happy Days. I also remember camping at Patches Campsite between 1959-1963. I was a Patrol Leader of the Seagull Patrol of the 5th Morden Scouts. I can also remember playing Bulldog and doing gang shows. The summer camps I went on were 1959 Isle of Arran, 1960 Barmouth North Wales, 1961 Morthoe in North Devon and 1962 Deal in Kent. If anybody remembers me or was on these camps it would be good to hear from you!! Does anyone remember Brian Whalebone, affectionately known as Blossom? He was with the old 12th Morden Group in Bow Lane and he was a stalwart of the Group and of the Association, always there always involved and always helping. The type of person that the Movement relies on. When I was a Scout, he was a Rover. Remember them? The last time that I saw him was about 10 years ago, I think, and he was then a member of the Scout Fellowship, which I think was an organisation for old Scouts who were 'displaced' when the Association disbanded the Rover Crew. And still a stalwart supporter, I bet. Does anyone out there remember him or know what he is up to now? Our Scouting experiences date back to the 1960s and we are still going strong having seen Morden and St Helier District amalgamate with Mitcham in 1990 and then with Wimbledon to become Wimbledon and Wandle District in 2004. Brian Whalebone was our son's scout Leader and he now manages our District Scout Store which sells uniforms etc from our District HQ - the old 3rd Morden headquarters. Paches campsite in Ashtead Woods is still leased from Merton College Oxford by the District. There is no water there now but the site is well used for backwoods camps, wide games etc. We were members of the 1st Morden for many years and now Dave is ADC Scouts and Lesley is County Secretary and a District administrator. Have just revisited this site for the first time in months and I am pleased to read the replies from the Bixbeys about Brian Whalebone and Patches camp site. We had so much fun there as boys of the old 12th Morden troop. Is the 'old 3rd Morden HQ' my old hut in Bow Lane I wonder? Thanks for the replies. I was a member of 14th Morden from 1950 to 1961. We were originally at St Peters Church, but soon after I joined moved to the Congregational Church in Green Lane. It was a very active Group we even had our own marching band (in which I played the Bugle) the band played at Church Parades once a month. I gained my Queens Scout in 1960 and at the same time took a warrant with 7th Mitcham at Mitcham Congregational Church. Is there anybody out there who remembers those days. Some memories on here for me. 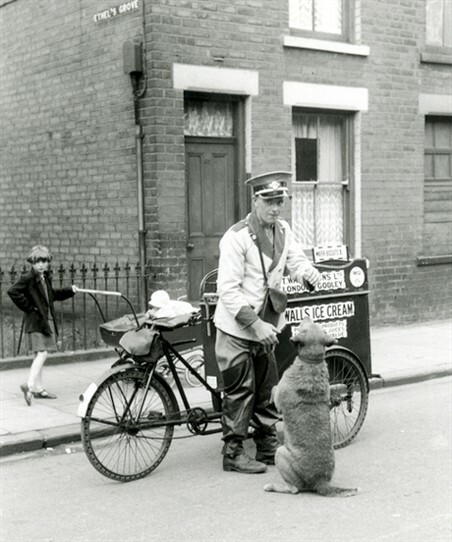 I lived in Shrewsbury Road, and originally joined the 10th Morden Cubs based at Welbeck School, where I was educated. When I went up into the scouts I didn't like it, so left. Later through some circumstances, at about the age of 13 in 1958 I joined the 8th Morden and went straight into the Senior Scouts. I have to say in retrospect, the scouts helped put values into my life, and I really enjoyed my time with them until I got married in 1968. The hut in Glastonbury Road, with it's cosy feel became one of the best places to be. I remember Les and Olive Gooch who ran the cubs, the whist drives, the jumble sales (I still have a utility radio bought for a shilling and some American railway magazines), Ray and Leonard Owen, Eric Piercy, especially Derek Warboys. Patches, what a lovely camp site, we spent many hours there. It was often the destination of a Night Hike, when 11pm was the pits, now most of the world is still awake. I have some photographs which I'll try to copy and add to the site, perhaps some old friends will wave to me, I haven't seen any of them, except for one brief occasion since I was married and moved away. I have to say that I was never really aware of the Scout Cubs when living on the Morden side of the estate but I did belong to the 8th Mid-Surrey Lifeboys who were based in Farm Road. It was run by a Mr Oliver who only had one arm but that didn't stop him driving us around in his Landrover whenever we needed transport. There were 48 of us Lifeboys and we had a very strong football team. The team always visited Fegans Boys Home in Oxfordshire once a year and we all went away to Somerset for summer camp. I remember sleeping 4 to a hut in the middle of a large field and having to take my turn in peeling onions with tears running down my cheeks. The locals thought we were a bit 'rough' and it didn't help when they organised a cricket match against the local youngsters and we bowled them out for 9 runs. After the first 2 or 3 wickets went down Mr Oliver frantically tried but failed to get a message to the bowlers not to bowl so fast. I guess it was testimony to the amount of sport we enjoyed playing on the St.Helier Estate - great memories. Peter Penfold mentioned having a mate called Ron Kercher who ran the Scouts. My late father in law was a Ron Kercher and lived on the St Helier Estate. Could this be the same Ron Kercher ? Stuart Barber. Ron Kercher mentioned by Peter Penfold is very much alive. Stuart, the Ron Kercher mentioned by Peter Penfold is still alive and well I'm pleased to say. 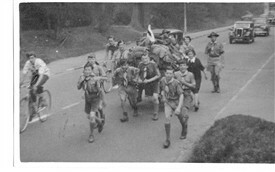 I remember with great affection the years with the 2nd Morden Scouts. All the people and places mentioned by Peter are vividly recalled especially the Germany trip. Somewhere I have some photos of the trip but am having trouble finding them but will continue looking. Hi Stuart, I am the Ron Kercher referred to and am still alive! Interesting to know there was another one in St Helier. 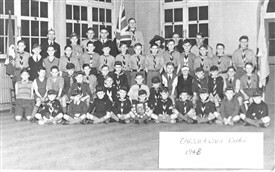 I may have some interesting points regard the camps at Patches and Kingsdown as I had been a Cub, meeting Thursdays, before becoming a Scout meeting Tuesdays and Friday's, later gaining my 2nd Class. Working towards my 1st Class learning wood chopping, when I left at the reluctance of our scout leader, as I unknowingly (merely being my usual self,) had been chosen as winner of the camping competition at Kingsdown Scout Camp before deciding the following year to leave, as my friend declined to join. It was with much regret after, as I thought I would join the Boys Endeavour Club, in Martin Lane, Morden, but all I did was sit outside on my cycle for a few minutes, then rode off. From John Wilkin's in depth essays on the web, I would be interested to hear from John, as I do remember something of his question as to how we got home from camp at Kingsdown? Also, there is something significant that sadly happened whilst we were at Kingsdown, as from his essay I think we would have been there at the same camp. Do you remember the lighthouse beam sweeping over the camp fire at night, and the handout of finger biscuits we could dip in the cocoa under the warmth of the fire. Coming up from the Cubs, we were too numerous being part of the post war baby boom, so the Woodpecker Patrol was formed, in rival with Beavers, Kingfishers, and one other patrol, someone maybe able to advise me. Patches camp was every Whitsun, we would push the cart all the way there, and all the way back to Bow Lane. At times we'd get relief from the car following us, it was however a matter of endurance as it was some distance. I have just returned to this site after a long while. Nice to hear that Mr.Terrell has been reading my stuff! Just memories. I am pleased to read that Patches is still in use and yes I do recall the lighthouse beam. I think that most of Kingsdown is a housing estate now. I was telling my young grandson, who is a cub, about the great times and my experiences as a scout when I came across this site which brought the memories flooding back. I was the Troup Leader with the 8th Morden in the mid fifties. Derek Worboys was the Scoutmaster. We often loaded up his Morris 8 convertible with equipment, stored at the hut beside the railway in Glastonbury Road, and drove off to Broadstone Warren. In 1957 I had the honour of representing Morden District at the 9th World Jamboree at Sutton Coldfield. Morden District also played host to a group of Canadian Scouts who came over to attend the event. My family were associated with the 8th Morden, my uncle Ron (Chamberlain) being an assistant scoutmaster and my grandmother (Lilley Chamberlain) helped run the whist drives with Mrs Gooch. So when we moved from Brixton to Shrewsbury Road on the St. Helier Estate it was natural for me to become a scout with the 8th. Could not have done better. First group meetings were at the Hut but as the group grew in size we moved to Glastonbury School where I was a pupil in the G Stream. Does anyone know of the Fosbury brothers? If my memory serves me - which lately it doesn't that well - the cubs were run by Derek Gooch and his wife. I believe they lived near the California PH at Belmont? Once I started work in London I found it difficult to commit the time to scouting which, reflecting over the years, was a great shame as it had given me so much. I became a Policeman in 1962 in East London and never went back. I have now encouraged my eldest grandson to become a cub and the younger one, who has just reached seven is about to join the cubs. I could not be more happier in knowing they will not only have great fun but learn values which will equip them in their future life. To all of you associated with the 8th Morden I wish you well and thank you for the memories. Michael Chamberlain, Benover, Kent. I have just returned to this site since my last posting and find it interesting to read all the subsequent postings, well done chaps. One thing I forgot to mention then was a Cup awarded to the best long distant runner. It was called the MAPP trophy, and the winner held it for a year until the next race. However I was last to win it, so it stayed with me, and I still proudly display it, after all these years. As promised I have put a photo of my wedding, posing with fellow scouts, none of them have waved to me yet, hope they're all ok.
Hi - I have just come across this page as I've been researching some thoughts following my mother's recent passing. I wondered if my reminiscences may be interesting to anyone? I was a scout in, I think, the 12th Morden (HQ was in Bow Lane, off Lower Morden Lane) in the late 60's and then moved to the 1st Morden (I think that was the designation at the time) in Central Road. Scouting and I drifted apart when I was in my mid to late teens and I've not kept up or renewed my interest since then (some 45 years ago). My family were very active in the local groups - my dad was C.W.G Oliver, known as "Don Oliver" (not the Mr. Oliver above - my dad had both arms!) He was, I think, Scout Leader at the 1st and then GSL for them. My mum was an Akela in the same group, I think. I had an uncle, aunt and cousin also active there. Bob Walmsley was GSL for a while, Betty was also something uniformed with the cubs and Mike was a venture Scout. One of my most enduring memories was helping to build a new scout hut in Central Road - it was on some land adjoining the railway, approached down a narrow path. Looking at Google maps now doesn't help as this area seems to be built up a bit more. My dad died in 1986 and my mum has only just died. Bob and Betty Walmsley moved to near Winnipeg in Manitoba in, probably, the 1970's; Betty died about 10 years ago and Bob about 4. Mike Walmsley trained as a teacher in the UK, taught here then moved to Edmonton in Saskatchewan, where I believe he still is. I have fond memories of the time I spent in the scouts and remember Patches and other camp sites. Strangely, we now live very close to Phasels Wood in W. Herts. which I remember visiting all those years ago.